Wedding season is coming up. As a guest, you want to look stylish and chic, but obviously you don’t want to distract from the bride or draw attention for the wrong reasons. If the dress code is not determined in the invitation, assume that you should be dressed elegantly, but take into consideration the time of year when determining your wedding attire. What dress should I choose? The first criterion that helps to choose the right outfit is the type and the location of the event. Wedding is a family celebration where elegant clothing is required. Women usually opt for cocktail dresses that are feminine and very chic. The place where the reception takes place is an important aspect when choosing a costume. On so-called garden party that is an outdoor event, it is recommended to wear pastel colors. 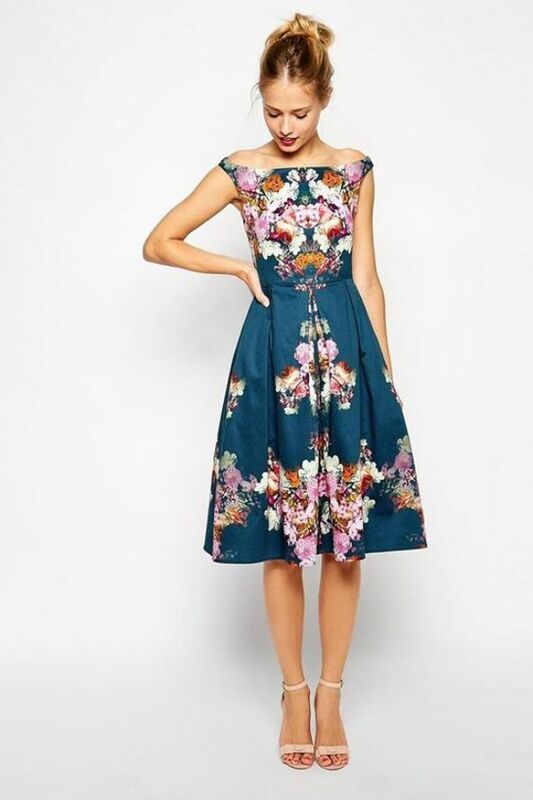 If you are invited to a cocktail party that starts at the afternoon, a perfect choice will be a cocktail dress. On the other hand, if the newly married couple has prepared a sumptuous dinner for their guests in elegant interiors, then the maxi evening gown fits into the mood of the venue. Can I wear a white or black dress for a wedding? The golden rule of the wedding is don’t ever, ever wear white. You should also avoid wearing white to prewedding festivities, like the engagement party, shower or rehearsal dinner. On this day white and ecru are reserved exclusively for the bride. Forbidden color is also black, which symbolizes mourning, so better leave black clothes for that day in the closet. At weddings, pastels and juicy colors are perfect. Feminine red, bottled green, indigo grenades are great propositions. Pastel dresses have been always associated with wedding styling. Bridesmaids and guests like to choose this colour. However, if you want to look different than half of the guests, set it up with white sneakers or high heels. If you are going to an open-air wedding, make sure you have a fresh flower headband. Pastel shades can also be enriched by black accessories. No matter if the couple decides to attend a church or civil wedding better have an overcoat during the wedding. In the summer without a problem you can choose a jacket or a thin coat. During the winter, prepare a thick elegant coat that will go well with your outfit. If you know the wedding is going to be held in a Catholic church, it might not be a bad idea to cover bare arms with a jumper and avoid showing too much leg or cleavage.